Think you have cat-like reflexes? Prove it in Atomic Rush, a new exciting arcade-style game that brings the latest in touch and LED technology. The game allows you to pick one of 4 colors to play and can allow all 4 colors to be active in a game at once. That way you can play alone or against as many as three friends. The object is to tap as many of your colored lights within the room to get points. The game last for 60-seconds, and in that time you are bound to feel the RUSH! Atomic Rush has three different levels of difficulty to choose from: easy, medium, and hard. 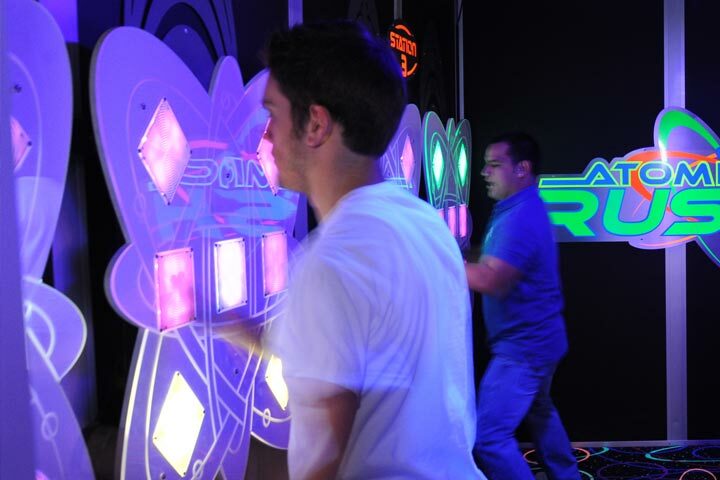 In easy mode you will remain stationary at two large light up boards on the wall and try to hit your color as it shows up. In medium mode you will start out at two large light up boards on the wall and throughout the game it will announce a direction to move and you will have to go to a different set of boards in the room. In hard mode you will be using all of the light up boards on the walls throughout the room at the same time, you will have to bounce between the different boards to get your color as fast as you can.